More and more people may be crowding around their phones for Pokémon GO base activities and maybe even dates. Fervent Pokémon GO players might be finding more than new pikachus to train through the game: they could stumble into a little bit of romance. 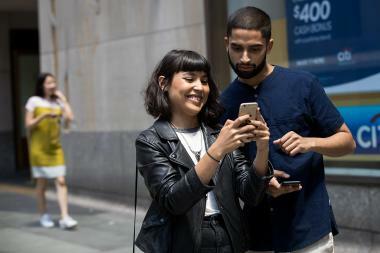 With so many New Yorkers obsessively playing the game — and thereby attracting the attention of everyone from the NYPD to the MTA — a company has built a way for Pokémon GO players to chat with nearby users in a radius of up to 600 miles. Razor, a San Francisco-based company, has created RazorGO, a site and soon-to-be mobile app that lets Pokémon GO players toggle between different types of chat, including team chats and private mode. They're able to find other players nearby by dropping beacons that will notify users that are near them. According to a press release on Razor GO's website, there will soon be an app for both Android and iPhone that will allow users to coordinate according to team colors for ultimate gym takeovers. Though Razor's website hasn't said as much, a Daily Dot post speculated that people might use the private setting for coordinating dates. Another Daily Dot report highlighted that Pokémon GO has caused some users to seek out anime-themed dates. According to Craigslist's NYC Casual Encounters page, there have been over 10 lusty Pokémon-themed posts created since the app launched earlier this month. Project Fixup, a dating service has also added a Pokémon GO dating section to their website. If all goes well, New York City may soon be littered with Poké-buddies and Poké-couples who will catch pikachus along Central Park's scenic bridges. ► MAP: Where Are You Finding Pokémon in New York City?